Group size: For a Grand Traverse to go ahead we need a minimum of four persons. The maximum is eight persons. Cost: This depends on a variety of factors, like group size, number of days, how many resupplies, porters, etc. 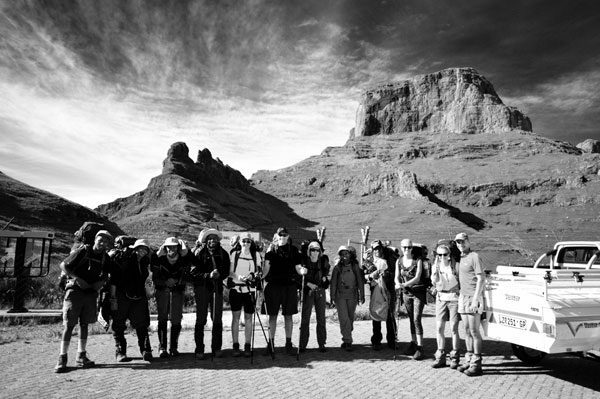 Date: At the start of the traverse we will get together at Witsieshoek Mountain Lodge. We normally spend the first night after the hike at a guesthouse in Underberg. This is not compulsory. If you rather want to shoot off home on the day when the hike is done feel free to do so. It is only there to celebrate a bit and to enjoy a bit of comfort before we go our separate ways. This is totally up to you. GUIDING: For the duration of the hike by an accredited Mountain Leader (NQF and MDT). All guiding we provide complies with the adventure guiding laws of South Africa. NQF – National Qualifications Framework. MDT – Mountain Development and Training Trust. Your OVERNIGHT FEE for the duration of the hike (13 nights). This would be your hiking permit. ACCOMMODATION and BREAKFAST at Witsieshoek Mountain Lodge. We will be going for bungalows which sleeps two persons each with an en suite bathroom. This is for the night before the hike commences. ACCOMMODATION and DINNER at Sani Mountain Lodge: We will be going for the backpackers lodge. There are hot showers, basic cooking equipment, beds and bedding. This is for the night when we arrive at Sani Mountain Lodge. TRANSPORT: All transport related arrangements. By this we mean getting ourselves to the start, getting our vehicles to end as well as your vehicles (where needed). THE FIRST RESUPPLY AT ORGAN PIPES PASS (day 4). The resupply team’s guiding fee. This will be driven and led by an accredited Mountain Leader. Porters and their daily porter fees. Their overnight fee for the duration of the resupply (their hiking permits). Their transport costs to get to and from Cathedral Peak (Organ Pipes Pass is in the Cathedral Peak area). This resupply is 2 days and 1 night in duration. THE SECOND RESUPPLY AT BANNERMAN PASS (day 7). Their transport costs to get to and from Giants Castle (Bannerman Pass is in the Giants Castle area). THE THIRD RESUPPLY AT SANI MOUNTAIN LODGE (day 11). A vehicle, trailer and driver up Sani Pass. Note: The resupply teams are there to bring you clean clothing, fresh food and take away your rubbish. We cannot carry gear for 14 days (in case you did not know). ACCOMMODATION and DINNER at a guesthouse in Underberg for the night when the hike is done. Note: It is up to you to decide if you want this to be included or not. GRAND TRAVERSE / ITCHYFEET SA goody bag. You will have to wait and see what this is. Arrive at Witsieshoek Mountain Lodge. Day 1 – Sentinel Car Park to Ifidi Buttress area (distance, 17km / height gain, 1260m). Mont-Aux-Sources summit day. Day 2 – Ifidi Buttress area to the source of the Orange River (distance, 16.5km / height gain 622m). Day 3 – Source of the Orange River to Mlambonja Pass area (distance, 12.2km / height gain, 566m). Day 4 – Mlambonja Pass area to Organ Pipes Pass. The first resupply is here (distance, 12.6km / height gain, 728m). Cleft Peak summit day. Day 5 – Organ Pipes Pass to Didima Cave area (distance, 15.2km, height gain, 982m). Champagne Castle summit day. Day 6 – Didima Cave area to Leslies Pass (distance, 17.3km / height gain, 517m). Day 7 – Leslies Pass to Bannerman Pass. The second resupply is here (distance, 16km / height gain, 727m). Mafadi summit day. Day 8 – Bannerman Pass to the Lotheni area (distance, 15.9km / height gain, 847m). Giants Castle summit day. Day 9 – Lotheni area to the foot of Thabana Ntlenyana (distance, 18.7km / height gain, 755m). Day 10 – Foot of Thabana Ntlenyana to Sani Mountain Lodge area (distance, 16.8km / height gain, 880m). Thabana Ntlenyana summit day. Day 11 – Hike to Sani Mountain Lodge. The third resupply is here (distance, 6.5km / height gain, 110m). 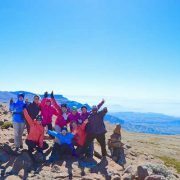 Day 12 – Sani Mountain Lodge to Mashai Pass (distance, 20.5km / height gain, 960m). Day 13 – Mashai Pass to Thomathu Pass (distance, 16.8km / height gain, 730m). Day 14 – Thomathu Pass to Bushmans Nek (distance, 11km / height gain, 270m). Remember this is a self-catered hike. We always encourage self-catering because (1) it is more cost effective and (2) practically it makes a lot more sense.